Two weeks ago I travelled to El Salvador for work. I was fine when I got on the airplane and then when I landed I was not. Or rather, I noticed a tickle at the back of my throat. Within a day I had a full on chest cold and had completely lost my voice (I mimed my way through the rest of the trip). All I wanted to do was curl up in bed, but I had meetings scheduled from early in the morning until late at night–no slowing down allowed. By the time I landed back in the U.S. I was exhausted, mute and my cold gave no indication of letting up. I basically lived on this tea for the next few days–almost using up an entire baby ginger root from the farmers’ market. Baby ginger costs a fortune, clocking in at around $17 a pound–I have been slowly accumulating it in small pieces from one of my favorite farmers. Moister than the ginger root you find in most stores, it has a more delicate flavor and no tough skin–you can just use the root whole without worrying about peeling it. Baby ginger has a short shelf life in the refrigerator, however it freezes beautifully. You can use it straight from the freezer grated or sliced in cooked dishes, without having to worry about trying to defrost the root. For this tea, I used a good portion of the ginger to combat my nausea from the cold medicine. I added in some fresh mandarin–which is finally starting to appear on market shelves–for its sweet citrus taste as well as its helpful dose of vitamin C (one mandarin has just about half of your daily dose of the vitamin). Lastly, I stirred in some local honey to soothe my throat. This tea is great for when you are sick but is also really nice to just enjoy on a chilly day. To Make the Tea: Combine the mandarin sections, mandarin peel, honey, ginger and water in a medium saucepan, muddling the mandarin sections with the back of a spoon so that they all split open. Bring the mixture to a rolling boil. Reduce heat to a slow boil. Boil until the liquid in the pot has been reduced by about one half, approximately 20 minutes. Strain through a fine mesh sieve into a mug and enjoy. 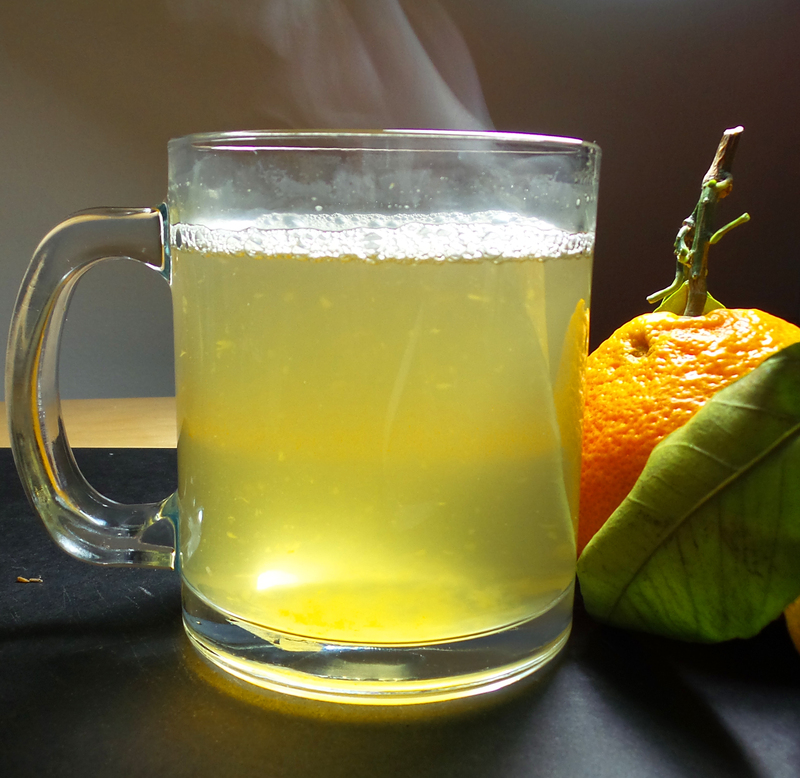 This entry was posted in Drinks and tagged baby ginger, cold, drink, flu, honey, mandarin orange. Bookmark the permalink. Sounds delicious! I always make ginger, honey and lemon tea when I’m sick, but mandarin sounds lovely for a change. I hope that you are feeling better now. Thank you, I’m feeling much better!